Sound familiar? If so, wouldn’t you like to find a way to change all of that? Whether you run staff, team, or client meetings — or attend the meetings that other people hold — youll find this product of interest! 62 minutes of MP3 audio with Transcript & Note-Taking Guide. They provide even more techniques to help you make meetings work, either as the leader or a participant! No one ever has to feel victimized by bad meetings again — like I used to be — even in some of my own! Adele has given us the step-by-step details on how all of the attendees, not just the leader, can take responsibility for making meetings work. You will have instant access to the 47-page PDF meeting handbook that covers every facet of setting up and running stellar meetings. Do you want to stop dysfunctional meetings dead in their tracks? With these how-to tools, you can make your meetings hum and participants sing on key. No more sharps or flats to worry about with this award-winning guidebook by your side! Concise enough to use in a group setting, yet complete enough to give you the A-to-Z tips you need, this guide delivers 7 powerful step-by-step checklists that are guaranteed to erase meeting headaches forever. It even has a meeting cost calculator that automatically estimates how much you may be investing  or wasting  on meetings! From start to finish, youll learn how to plan, schedule, start, conduct, end, and summarize meetings effectively. At last, you can ensure that the right people participate in making meaningful decisions that are recorded for posterity and produce results. Youll have instant access to the 47-minute interview that explains, in detail, all of the important steps for setting up and running stellar meetings. The interview was part of an 8-week series by Adele Sommers, Ph.D., hosted by business training moderator Greg Williams. Youll instantly access the 33-page PDF Transcript and Note-Taking Guide, which will help you anchor all of the key points in the MP3 audio recording. The transcript and audio expound on my A-to-Z system for planning and running great meetings, and also include several guerrilla techniques for successfully influencing meetings from the sidelines! 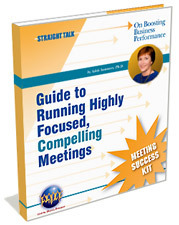 All together, this package will turn you into a real meeting-management pro! the Meeting Success Kit with me! Like the subject itself, the materials are highly focused and compelling! They also achieve that rarity: They can be read on several levels  serve as a primer for relative novices… with plenty there for more advanced professionals, too. At whatever level, lots of ways to take your information and run with it. And even for the most passive reader, theres plenty that will stick. The book brims with clarity, focus and immediate application. I thoroughly enjoyed the mix of facilitative and guerilla techniques. Its almost a Meetings-in-a-Box, with tips, tools and insights that can be used right now or as needed  along with ready-to-go templates and samples. And I appreciated the ample added value throughout: How to positively influence a meeting from the sidelines; key phrases guaranteed to keep meetings on track, on topic and on time; and some truly breakthrough brainstorming techniques. Best of all, it empowers everyone  whether youre running the meeting or just attending. 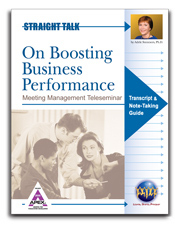 Its an engaging guide that, once read, makes you a more engaged meeting participant. Tip #4 (Start the meeting on time and discuss the preliminaries) has become my personal meeting mantra and signature procedure with colleagues. I used it the first time exactly as it appears in the Guide  and it worked. When I read over Tip #5 (Conduct the meeting using good facilitation techniques), most of the points sounded like common sense. Then I realized how few of those excellent ideas were being applied at our campus meetings. I decided to put in place almost all the checklist ideas, including the parking lot. I was really surprised when part of the list of tangents ‘parked’ on the chalkboard morphed into the focus for our follow-up meeting. I was so impressed by this concepts benefits that many of my class periods now include a note taker who helps me with parking lot ideas we can return to at a later class meeting. Regarding Tip #7 (Follow up afterward with summaries and action items), your idea for the summary paid dividends in my meetings with the faculty. One of my colleagues had printed a hard copy of my e-mail summary and, without my urging, took it upon herself to perform the role of reminder. I love it. Everyone should perform routine follow-up, using an e-mail summary. I would also encourage anyone in the workplace to spend some time contemplating the multiple deep core lessons that emerge from a close reading of Appendix C (Is a Lack of Peer Cooperation Getting You Down? Try Triangulation). YES, Adele  I want to order your Meeting Success Kit right away so that I can start transforming my meetings into highly effective collaborations! Be assured that these tools will help you make an immediate difference in your organization. Not only will they propel your meetings to greater success, but youll be perceived as a highly effective and competent leader. This alone can have a tremendous influence on your business relationships and career advancement!